The National Science Board, the governing body for the National Science Foundation (NSF), has approved an expansion project for the Very Large Array (VLA) radio telescope in New Mexico. The board recommended an NSF award of approximately $58.3 million for the project over the next decade. The action came at the Board's meeting in Washington on Nov. 15. "This approval means that the VLA, already the most scientifically productive ground-based telescope in all of astronomy, will remain at the cutting edge of astrophysical research through the coming decades," said Paul Vanden Bout, director of the National Radio Astronomy Observatory (NRAO). The expansion project will replace aging equipment left over from the VLA's construction during the 1970s with modern technology, improving the VLA's scientific capabilities more than tenfold. Using the existing 27 dish antennas, each weighing 230 tons, the Expanded VLA will have greatly improved ability to image distant celestial objects and to decipher the physical nature of those objects. In addition to the $58.3 million NSF allocation, the governments of Canada and Mexico plan to provide funding for the VLA expansion. 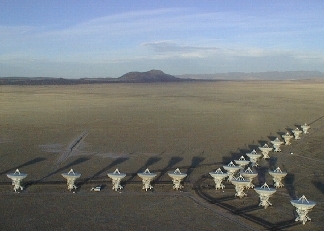 The VLA Expansion Project was formally proposed to the NSF, which owns the VLA, last year. Also last year, the project received a strong endorsement from the Astronomy and Astrophysics Survey Committee of the National Research Council, the working arm of the National Academies of Sciences and Engineering. That committee had been given the task of setting nationwide priorities for astronomy spending over the next decade. Since the VLA's dedication, many technical improvements have made it much more capable than its original design contemplated. However, some of the technologies incorporated into the VLA during its construction, while highly advanced for their time, now limit its capabilities. The VLA Expansion Project will replace those older technologies with modern technology, allowing the VLA to realize its full potential as a tool for scientific research. "Keeping the VLA at the forefront of technology is an important priority, and we are fortunate that Sen. Pete Domenici (R-NM) has recognized this for many years. We appreciate his longtime support for this valuable scientific facility," Vanden Bout said. "Senator Domenici is one of the VLA's strongest advocates, and as a leader in the U.S. Senate, has continually supported the VLA and its expansion in Congress and the Federal Government," Vanden Bout added.